“Great Water of the sunset… When all the Indian tribes had been established on this present earth, the Sun said to Changing Woman, `Your work here is finished. You may now go to the place of the sunset, where, far out over the great waters, I have built a house for you. I will send powerful guards with you — the Hail, the Thunder, the Lightning, and the Water Ruler. “This house was built on a beautiful island called `Land that Floats on the Water.’ In it were four rooms and on each was on floor. And, for each floor there were ladders of black jet, white shell, turquoise, and abalone on all four sides. On top of the house there was a multicolored thunderbird, larger than any that has ever been seen, who was the chief of all thunderbirds. “On his back he carried small thunderbirds of all the ceremonial colors. In the center of this palace was a large room with an altar decorated with all the colors of every flower that had bloomed and faded on earth, and with the spirits of all the birds. The main entrance was toward the east and was guarded by a white-shell rattle which gave the alarm whenever a visitor approached. “To this place Changing Woman came to live forever and meet the Sun in the evenings.” — Hosteen Klah, Navajo Medicine Man and Sand Painter. A nice rendezvous home for a woman who had done her work well and deserved a nice second place to live! Just like the Western notion of the soul, Holy Wind exists everywhere. Every living thing is part of it. 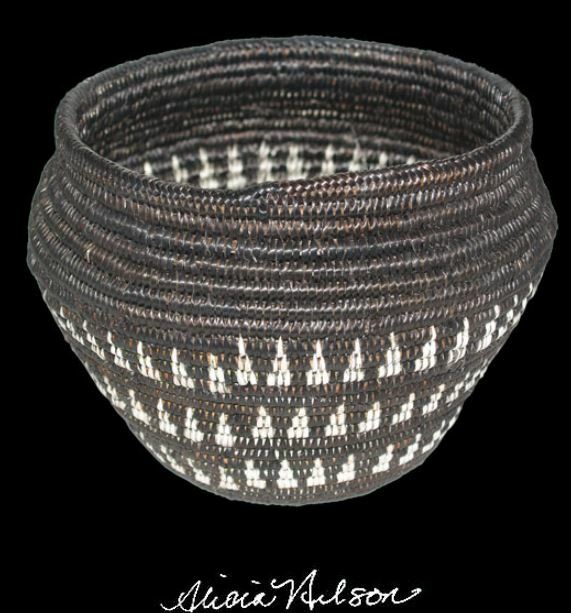 The basket pictured is made by Navajo artist Chris Johnson. As a member of the Betty Rock Johnson family, Chris has been schooled by the finest. Using richly traditional colors of red and black and a wind energy theme, Chris had made an interesting crossover piece. Chris’ weavings do not last long so don’t hesitate. Holy Wind is the underlying element that unifies all beings. People, deer, buffalo, spiders, stars, clouds, goatheads, fish and pinon trees — everything — are all united by breath and wind. The singe soul sings within it, and us, all. Because we have kinship with all living beings, we also have the responsibilities that come along with those connections. This means that the earth, animals and plants that live on it (as well as the sky with its entities and phenomena) are related and will take care of us. And, they will provide for us as long as we recognize that we’re responsible for being part of the earth and the sky, too. It’s a two-way street. Breath and speech are intimately related to the concept of Holy Wind, or nilch’i. There is a holy quality to breath that we don’t often recognize in our culture. 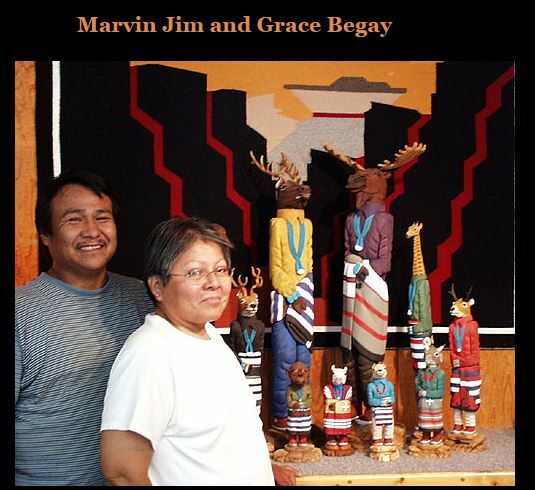 Traditional Navajos think of breathing as a sacred act that unite all living beings. It is possible for a patient in a healing ceremony to breathe in the life-giving power of the sun outside of the hogan, because the chanter’s breath rolls inside the hogan. The intimate relationship between speech and breath is a life principle that makes the very act of speech act sacred. Words have a sacred, creative power. 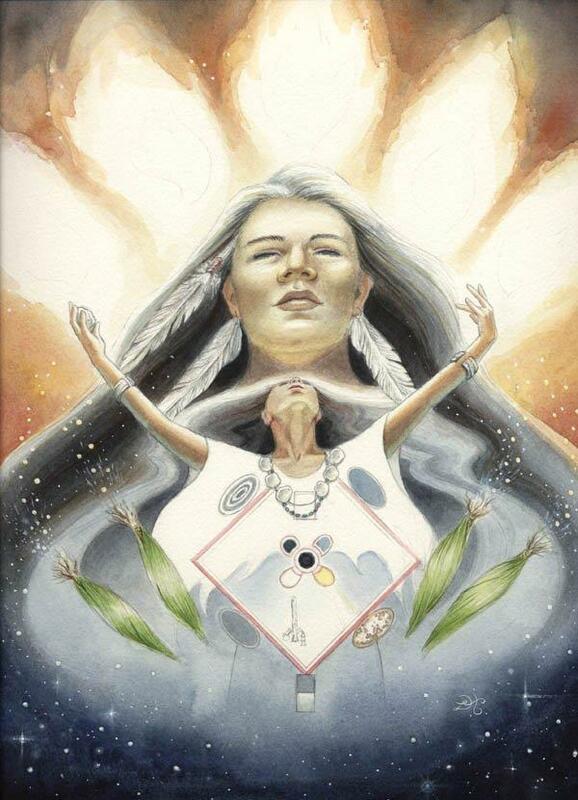 In Navajo creation stories, the Holy People spoke, sang, and prayed the world into existence. The uniting power of Holy Wind is the same force that fills the Holy People themselves with life, movement, speech, and behavior. We have direct access to the thought and speech of the Holy Ones through breath and words. That Holy Wind, or soul, is our inner form, and so it is with all living beings. Beautiful. 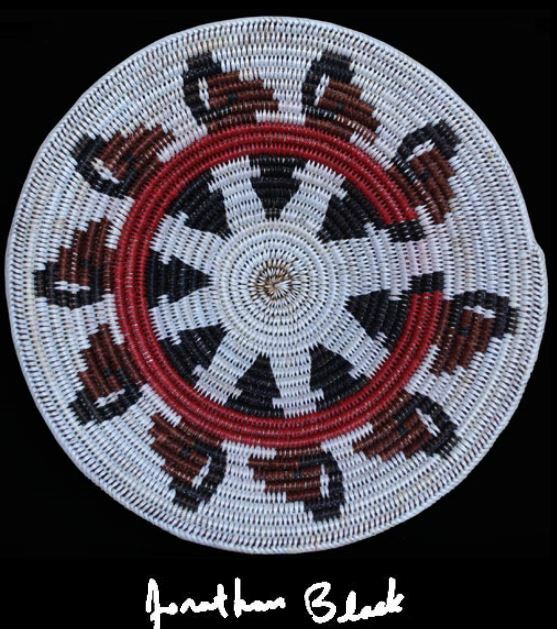 The basket above is made by Navajo artist Chris Johnson. As a member of the Betty Rock Johnson family, Chris has been schooled by the finest. 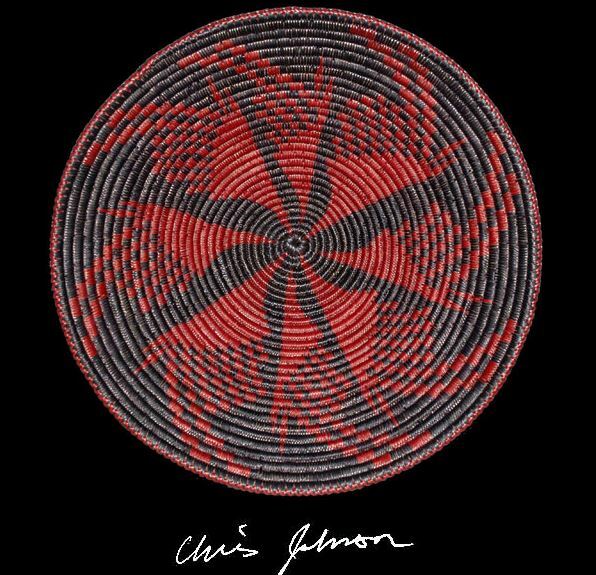 Using richly traditional colors of red and black and a wind energy theme, Chris had made an interesting crossover piece. Chris’ weavings do not last long so don’t hesitate. Kokopelli was a frisky and fruitful guy. As a matter of fact, you could say that he was the Johnny Appleseed of the Southwest. His trade route was large. He played his music and spread his seed from Southern Utah to Mexico. To the Navajo, Kokopelli is called “Water Sprinkler”, and he is a symbol of fertility in both the natural and human sense. To the Hopi he is the symbol of the Flute clan, and he adorns pottery, baskets, and Katsinas. And, he is always surrounded by humor. This funny-looking being, with his back hunched, carrying seeds, was somehow able to enchant women into loving him and mesmerize men out of their most prized possessions. Many women considered it to be an honor to be chosen as his “dreamtime companion” when he stayed in a village until he moved on. If you’d had trouble having a baby, Kokopelli would take care of that. He fathered children left and right. The Hopi people believe Kokopelli gets his energy and heat from the very center of the earth. And, coming from the center of the earth, he brings love and fertility to all plants and animals. 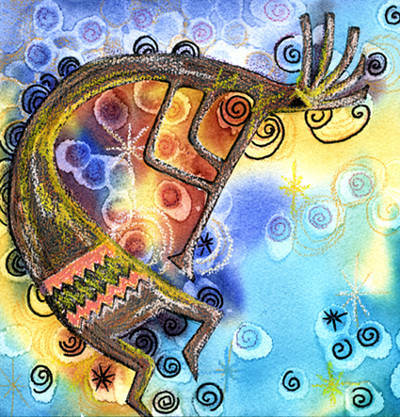 Kokopelli has the spirit of the Trickster. This hunchbacked flute player is sometimes called the Casanova of the Cliff Dwellers. His image was cleaned up hundreds of years ago by Catholic priests as they arrived in the Southwest. But, he is still here, etched in petroglyphs, playing his flute for everyone to enjoy. We believe that Kokopelli is with us still, just beyond our reach but inside our dreams, and that he will continue his journey and trade route into the future. Oh, magical southwest… We love you.